Rega Aria review | What Hi-Fi? Rega may be best known for its Award-winning turntables, but over the last five years or so it has had a golden touch with electronics too. 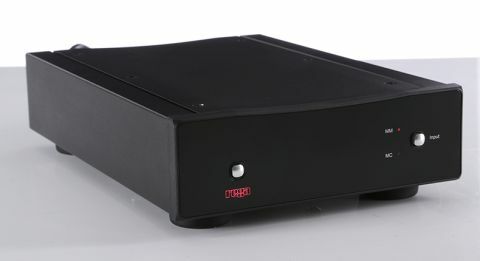 Just witness recent Awards for all three of the company’s integrated amplifiers and both its entry-level phono stages. That great work continues with the premium-priced Aria. It’s an understated piece of kit, built into the same half-width metal casing as the company’s Brio amplifier. The Aria’s finish is best described as rugged rather than elegant, but it all feels solid and built to last. As expected the control count is low, with just a power switch and input selector on the front panel. The Aria has two inputs; one for moving magnet cartridges and the other for moving coils. Unusually, the MC section isn’t just the MM circuitry with some added gain, as it is in most rival designs. Here, Rega has designed and implemented two separate circuits, each optimised for the particular characteristics of each cartridge type. In theory, this should give a better performance. While the MM section is fixed – as is usual – there’s plenty of cartridge loading adjustment on the moving coil side, allowing the user to fine tune the capacitance and resistance of the input. There are also two gain settings for MCs, 69.3db and 63.5db, to aid compatibility with a wider range of cartridges. All these settings are adjusted by means of small switches on the Aria’s back panel. A phono stage of this quality needs a good source, so most of our testing was split between our reference Clearaudio Innovation Wood turntable (fitted with a Stradivari MC cartridge) and Rega’s own RP6/Exact combination to test out the moving magnet option. Unlike some rivals, the Aria doesn’t need to be powered up for days before its performance comes on song. It sounds right after a few minutes, showing an unusually broad range of qualities regardless of input chosen. This unit produces a responsive and agile sound that tracks dynamic shifts – both large and small scale – very well. This quality is obvious in a piece of music like Carl Orff’s Carmina Burana with its mix of brutal crescendos and low-key sections that require delicate handling. The Rega has plenty of resolution, and the ability to organise all that information in a coherent way. The music always makes sense, even when the piece becomes complex. This sense of composure and control is evident in everything the phono stage does, but importantly, excitement and entertainment aren’t sacrificed in the process. Tonality is a touch on the lean side, but the presentation never wants for weight or authority. Lows are suitably textured and delivered with plenty of power and grip. Take a listen to Nirvana’s Nevermind and the Rega is right at home. There’s no shortage of drive and attack here, and a rhythmical precision most rival products barely hint at. It’s the kind of sound that grabs your attention, never losing it until the track ends. The Aria is a fine all-rounder. It delivers all the passion in Radiohead’s downbeat Videotape while rendering the majesty of Holst’s Jupiter with conviction. There’s power, scale and authority on offer, but only when the music needs them. If you have a suitably talented deck we think the Aria is a superb buy. Phono stages of this quality are rare, particularly below the grand mark. Buy with confidence.